Our training can help you get the most from your PV*SOL program. Make sure you're using the software to its full potential by learning every button and feature. Begin designing all kinds of solar PV projects without delay, and produce professional reports. At one of our upcoming mixed-company courses regulalry in Machynlleth, mid-Wales. Maximum 8 attendees. At special events such as trade exhibitions. With a tailored session just for you and your company, either at your own premises or here in Machynlleth, mid-Wales. With an online session just for you and your company, tailored to your specific needs. Design PV systems including module & inverter selection. Compare different PV modules, inverters and configurations. Make a photo montage of the property with PV installed. Design domestic and commercial systems. Perform accurate economic analyses including using UK FiTs. Model complex systems with multiple inverters and arrays. Discover the impact of shading and optimise your design (premium only). Produce 3D visualisations of buildings and shading impacts (premium only). Visualise the cable route on the roof (premium only). By the end of a full course you will have learned how to customise solar PV systems to suit customers' specific requirements. You will be able to compare different components and configurations, offering your customers the most precise analysis. By the end of a one day group Q&A session you will have learned the answers to the most common and important questions. You will have produced a professional client report with precise data and exciting graphics, including a photorealistic representation of a property with PV modules added. This will include an economic analysis report with a variety of outputs. We can also discuss your ongoing projects. Take a look at our sample PV*SOL and PV*SOL premium course contents. 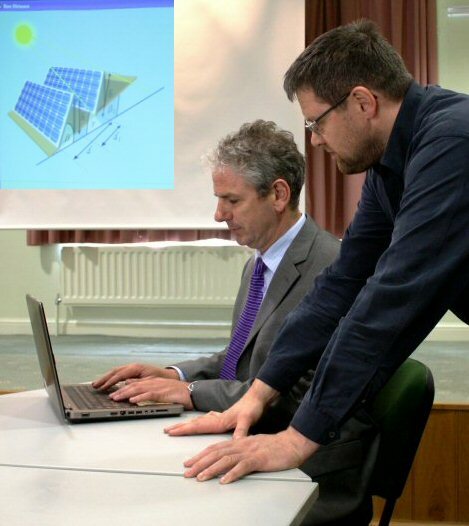 Our trainers have many years of experience in teaching PV*SOL and PV theory, as well as technical authoring in the renewable energy industry. You may also be interested in our two supplementary courses, Shading and Solar Surveying and Key PV Concepts. Key PV Concepts covers the foundational knowledge necessary to use PV*SOL, such as solar geometry; how inverters work; the area utilisation method for frame mounted systems and why shading matters. Shading and Solar Surveying is a one-day practical course where you will get to grips with the MCS shading methodology and become confident in conducting other types of professional site surveys. The training at the Solar Design Company was well-organised and very worthwhile, set in pleasant surroundings. Bryn had a deep understanding of the software, which together with his pleasant manner ensured a positive learning experience. The PV*SOL training was excellent; the course was well-structured and the presenter was obviously an expert in the tools used. I would recommend this training to anyone using or thinking of using PV*SOL. The Solar Design Company gave us a very comprehensive one day's training which cleared up all the areas of PV*SOL we needed clarifying. We are now proficient users of the software and are using it on a daily basis. Please pass our thanks to the trainer who was excellent.